Pram Carry All Bag -- One Design Sailboat Covers -- The Sailors Tailor, Inc.
We invented this product but others are copying our design. We originated this bag for keeping all your Opti parts organized and together. Full length zipper along the top for easy access. Rudder-attached-to-tiller-and-extension and daggerboard fit into 2 separate padded compartments. 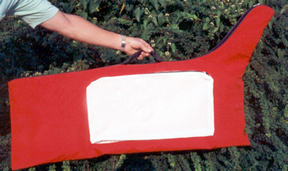 Bright coated nylon outer shell with 3/16” trico and foam inner liner for padding. Has mesh screen outer pouch with zipper across top for small or wet parts.